1 Oval Extendable Table 63Lx36Wx29H Extended Length:83. 6 Armchairs 22Wx23Dx37H. Seat Dimensions:18Wx18Dx18H. This patio dining set makes it easy to create a backyard space you'll love. Constructed with a weather resistant resin wicker that is easy to maintain and durable ensures this patio set remains beautiful for years. The generously padded seats make it a treat to relax in and enjoy the fresh air with friends and family. The powder-coated aluminum frame is another important detail that highlights the thoughtful construction evident throughout this set. The set offers four folding chairs with 5-position adjustable backrest and a square table with glass top. To have a drink, eat or play a board game, it's the ideal set. Take up little space for storage. The chairs can also be suitable for the beach or any other occasion. No assembly required for the chairs. Enjoy the warm glow of a fire while dining with the Cane Estates 7pc Woven Aluminum Balcony Height Dining Set with Gas Fire Pit Table Top. The Cane Estates Dining Set will invite excitement and class onto your patio or deck. The table includes an Ultra Stone table top with a rectangular burner and windshield in the center as well a Woven Base Cabinet underneath. The table's base will hold and protect a 20 lb. gas tank (not included) as well the control panel for easy operation. The set includes four Woven Back Balcony Height Chairs and two Woven Back Swivel Balcony Height Chairs with thick Seat Pads in a beautiful sand colored fabric to provide elegance and comfortability. Enjoy, style and comfort with your new Cane Estates 7pc Dining Set. Bahamas Oval 7-Piece Eucalyptus Patio Dining Set The Amazonia Collection is committed to providing premium quality sets with an elegant design that will make your home stand out above the rest. Crafted from solid Eucalyptus Grandis wood, grown in 100% managed forests in Brazil and certified by the FSC (Forest Stewardship Council), this eucalyptus furniture is known for its longevity and craftsmanship at an affordable price. Enjoy your patio in style with these great sets from our Amazonia Collection. 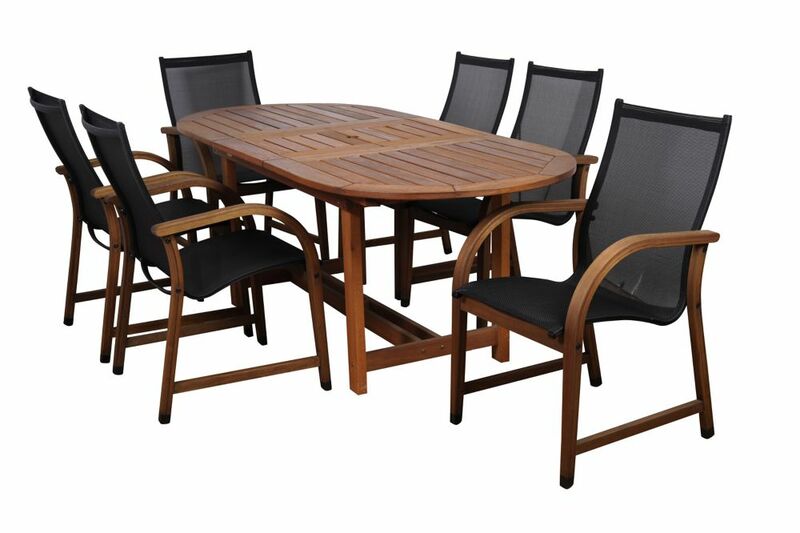 Bahamas Oval 7-Piece Eucalyptus Patio Dining Set is rated 3.6 out of 5 by 5. Rated 1 out of 5 by CandBinCT from We have had the table on our back porch for about a month. Some of the boards are already startin... We have had the table on our back porch for about a month. Some of the boards are already starting to show cracks. We have never heard of eucalyptus wood not being able to withstand a typical New England summer. We have teak toe rails on our 21 year old sailboat, and they are in excellent condition. We even put several coats of teak oil on the table before we put it on our deck. Guess that didn't help much. We also have an odd spot on the top our table that appears to be finished or coated differently than the rest. We thought the teak oil would blend it in, but it did not happen. See photo attached. The chairs assembled easily except for one. One of the seat tabs does not line up with the hole in the chair frame. The chair seems to be sturdy enough with only one screw in the seat, but there is no excuse for such inconsistent workmanship. We would not buy this set again nor recommend anyone to buy it. Rated 5 out of 5 by Canot from The set is beautiful, and was easy to put together.... The set is beautiful, and was easy to put together. It is a great replacement for the very heavy, cast iron set that we had previously. The chairs are lightweight and easy to move, and the table has a convenient pop-up leaf. Rated 5 out of 5 by Pat from Easy to assemble. Great quality. A beautiful set for our... Easy to assemble. Great quality. A beautiful set for our screened porch. Rated 3 out of 5 by Stephanie from Much Cheaper Elsewhere. This set is sold on at least 10 other sites at a much cheaper price. Way too expensive at HD!! Rated 4 out of 5 by lowrider from Looks Good So far we like the set. It was easy enough to assemble, some screws are more difficult then others but that's expected in furniture. There is a flip up leaf in the table to extend it for all six seats, I don't think that was in the description and we like it. Overall I like the set but i feel it was expensive. If it lasts us 20 years (It is in an enclosed sunroom to limit weather exposure) I will then feel the price is worth it.